Sculpture of Britney Spears giving birth to Sean Preston... This sculpture is ridiculous because Britney gave birth via C-Section in a sterile hospital operating room, not on a bear skin rug! Due to idiotic malpractice lawyers run amok and way too many frivilous lawsuits, the C-Section rate has risen to almost 40% nationwide. There are many who are having C-Sections as a matter of convenience as well. Some C-Sections are also performed in order to protect the mother and/or baby too. My understanding is that Britney's reason of undergoing this type of birth is to avoid the pain of childbirth. I also hear that she may be pregnant with her second child with K-Fed. Hit me baby one more time! Has Jessica Simpson had a breast augmentation? The above photos are from the most recent issue of In Touch magazine, where I was interviewed on this very topic. It appears that after her very public breakup with Nick Lachey, she has undergone a change in her breast size. The above photos show her in the same outfit, before and after the breakup. It does appear to me that her breasts have increased in size from a C cup to a D. There are many actresses who undergo changes in their breast size (such as Pamela Anderson and Britney Spears), both making them smaller and larger by likely exchanging implants for different sizes. It is possible that after her recent documented weight loss, she had lost size of her breasts and has had her previous implants replaced with larger ones. Most women who undergo breast augmentation fall in one of three groups: (1) Those who are usually in their twenties, have never had large breasts, and are finally at the stage in life when they can afford them, (2) Those who are usually in their thirties, have finished having children, and would like their breasts to be like they were before breast feeding and pregnancy changed them, and (3) Those women who have recently become divorced and are looking to improve their self image as they re-enter the dating scene. Is it possible that Jessica is one of the third group?? 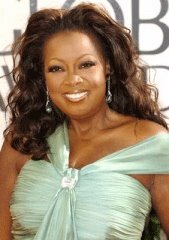 Star Jones has reportedly undergone a breast lift and tummy tuck recently while on break from the View. Unfortunately, sources are reporting that she had a major postoperative bleeding complication. This necessitated her being transported to St. John's Medical Center in Santa Monica for blood transfusions. This is a very unusual complication, but can happen to anyone. I am very hesitant to perform tummy tucks at the same time as breast lifts for this very reason. It is a lot of surgery for someone to undergo, and depending on the surgeon's technique, could be dangerous. Hopefully she will undergo a full recovery. What work have Meg Ryan, Teri Hatcher, Priscilla Presley, and Patrick Dempsey had done? My comments are in the newest issue of In Touch Weekly, on stands now. I believe all four of them have had Botox (Teri and Patrick have admitted to using it), in addition to lip plumpers for Teri and Meg (obviously). I've recently commented on Priscilla in a previous post. I think both Teri and Patrick look pretty good, but Meg needs to get those implants out of her duck-shaped lips and Priscilla needs to lay off the work for a while. Jessica Simpson is a spokesperson for Operation Smile. This is a very good group of plastic surgeons, anesthesiologists, pediatricians, and nurses who travel to third world countries and perform cleft lip and palate repair surgeries on children. Usually, these children would not have had any other options, and would otherwise be deformed for life. I helped on an Operation Smile child several years ago with Dr. Steven Ringler in Grand Rapids, Michigan. We repaired a cleft palate on a small child who was flown in for the surgery. There are many other groups which do similar things, such as Smile Train, but it was nice for Jessica to go out of her way to lobby for such a worthwhile cause. It's better than lobbying for Pizza Hut! Plastic Surgery 101 is another blog that you may find interesting. Although I focus strictly on celebrity surgery, Dr. Rob Oliver's blog (link to the right) focuses on other plastic surgery related topics as well. Check out his blog if you get a chance! My peeps are reporting that Lil Kim has asked to get out of jail so she can get treatment for her leaking breast implants. If anyone has any information on this, can you let me know? I posted a photo of her breasts this past month. Which are the best celebrity noses? I was interviewed recently by "Jane" magazine, where they asked me which celebrity noses are most requested by patients to look like. They printed my responses in this past month's magazine, as shown above. By far, the most requested celebrity nose is Halle Berry. I have gotten a lot of African American women who have asked for a nose like hers. Which nose do people NOT want to have? It's probably a tie between Michael Jackson and Jennifer Grey (after the nose-job, not before). Michael's nose is obviously worse than Jennifer's, but it's the change in Jennifer's overall appearance that people don't like. She doesn't look like "Jennifer Grey" anymore, and it may have unfortunately affected her career. But I have no doubt she may resurface again, since Nobody Puts Baby in a Corner! For my take on Ashley Simpson's possible recent plastic surgery, check out this week's Life and Style Weekly magazine. She's looking more and more like Jessica! Dolly Parton was the most obvious example of celebrity plastic surgery at this year's Oscars. From my perspective, it appears that she has had the following: Old-fashioned Browlift, Upper and Lower Blepharoplasties (eyelid lifts), Rhinoplasty, Facelift (more than one), Facial Fat Grafting, Botox all over, and Chemical Peels or Lasers for her skin. She has also had breast augmentation, and probably more than one (not news to anybody). Overall she looks pretty good, but may be going a bit too far. Her face is definitely showing the wear of age, but she is fighting it every step of the way. Unfortunately, she is crossing over into Joan Rivers-style work, and I hope that she doesn't continue to overdo it. I prefer more of a realistic look with my patients. Her eyebrows literally do not move, and this is not a good thing. Her plastic surgeon is reportedly a guy from Denver, who also does some operating out of Beverly Hills a day or two a week. Hard to work 9 to 5 when you're jet setting from the Rockies to Hollywood every week! 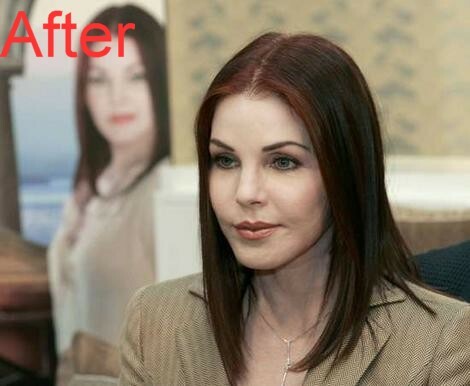 Priscilla Presley appears to have had quite a bit of work done lately. The changes in her face in the last 10 years have been astounding. She looked great in "The Naked Gun" movie series, but since then appears to have had too much plastic surgery. Her entire upper face appears overly Botoxed with a likely browlift. Her nose looks wider, and can be the result of scar tissue buildup from more than one rhinoplasty. Her cheeks have been overly-filled, likely with silicone injections or fat. I do quite a bit of fat grafting, but one of the keys to fat grafting in a natural way is to avoid injecting it in the lower face, with the exception of in the lips and under each corner of the mouth. Her face has become more rounded, with too much fullness in the jaw area and cheek hollows. This may be a consequence of a type of fat grafting where very large amounts of fat are injected. The upward pull of her cheeks and corners of the mouth are a possible consequence of a midface lift, which is a controversial surgery to elevate these areas. I am not a fan of this surgery, and find that people who have it done improperly can look unnatural. She also has overly defined lips, which could be surgically altered to emphasize the line between the lips and skin. Wow, if only Elvis could see her now. He'd be All Shook Up. UPDATE! : For more of my thoughts on Priscilla, click here for Did "Dr. Jiffy Lube" Treat Priscilla Presley? Holy cow! Has anyone seen Priscilla Presley lately? I swear I caught a glimpse of her during "Extra" tonight. She has had some major work done, and all of it bad. Once I get a photo I'll post it and comment. She's looking like th Joker, but with chipmunk cheeks.